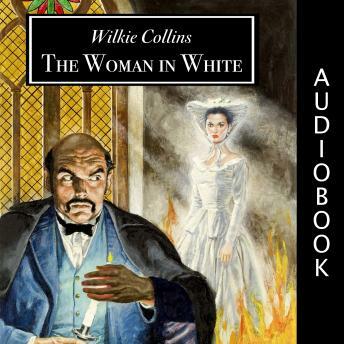 Considered to be one of the first bestselling mystery novels, The Woman in White was a huge commercial success when it was first published and the riveting tale has continued to enthrall readers ever since. Mistaken identities, locked rooms, madness, and romance these are a few of the ingredients the author used to inspire "the 'creepy' effect, as of pounded ice dropped down the back," that, according to one of his friends, was Wilkie Collins's aim in writing The Woman in White. Popularly regarded as one of the author's finest works, and widely copied by other writers, this thriller was the prototype for a whole new genre of fiction: the "sensation novel." A scheming nobleman, a beautiful heiress, and, of course, the enigmatic woman in white a mysterious figure confined to an asylum for the insan are the featured players in an intricate, compelling story that was acclaimed by Henry James and T. S. Eliot. The book itself is brilliant. The narrators of this particular audio version are not. There are a variety of narrators, a fitting aspect considering the array of narrative perspectives that comprise the original text, there is a lack of consistency that is quite off-putting. For instance, the voice of Marian Harcome is initially read by someone with an RP English accent, but this occasionally morphs into a different narrator altogether who reads with a strong American accent. The narrator reading the part of Mrs Michaelson is also read by an incredibly nasal American, whose voice is both unrealistic as far as the story is concerned, and highly unpleasant to listen to. I don't even want to go into her pronunciation of 'Torquay'. Overall, love the book, hate the delivery.